Happy Independence Day, Stamping Friends! Having moved to an area with actual seasons, we've recently discovered the joys of having a storm door...like the fact that you can't really hang a wreath off a storm door very successfully. Luckily there was a hook hanging to the side of our door, all ready for projects just like this one! 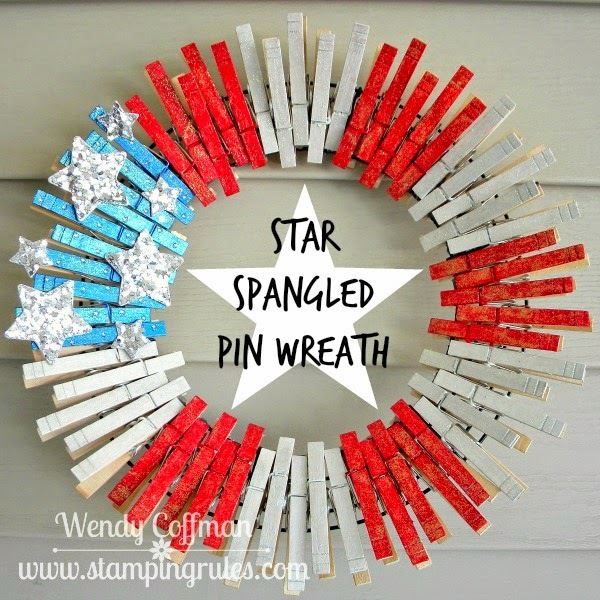 I built another Clothespin wreath! These are my favorite quick home decor projects lately. This time I painted the pins with metallic acrylic paints, and then smoothed on a layer of transparent glitter gel over each painted pin. It really catches the light and sparkles! I staggered the placement of the pins on the wreath form and held them in place with copious amounts of hot glue. I added some Star Chipboard from my stash painted with silver acrylic paint, then coated with Liquid Glass and sprinkled liberally with glitter. I did the glitter in two layers. First I added as much of this huge chunky silver hex glitter I scored from the kids craft section at my local craft store. 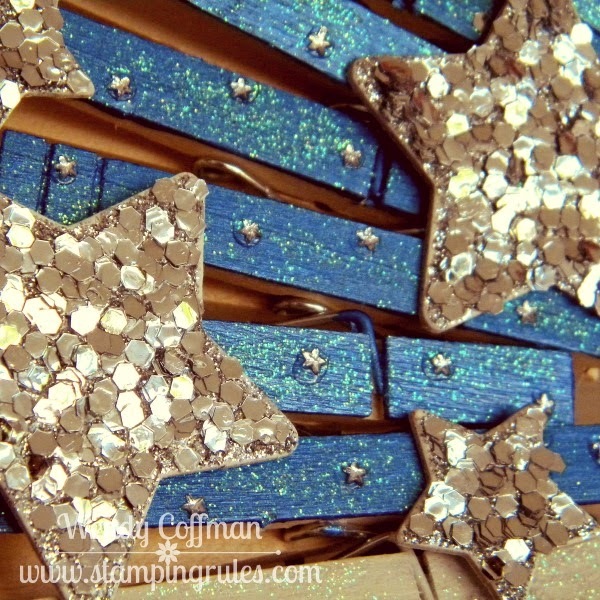 Then I sprinkled the still wet stars with super fine micro glitter to fill in any spaces. Finally I added a bunch of teensy star shaped nail gems for extra sparkle. We are lucky enough to be spending today with family from California. Here's wishing y'all a happy fourth, with lots of love, gratitude, and BBQ goodness!